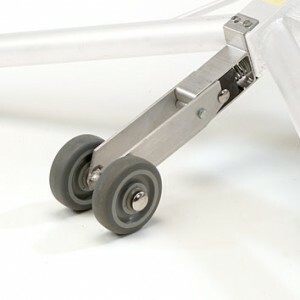 The hinged wheel kit is available for the X-Deck 4 Step and all the Pro Line X-Decks. This wheel kit keeps people from having to remember to lock the wheel kit, because it automatically locks as soon as someone steps on the X-Deck. How the wheel kit works is that there is an internal spring that keeps the wheel kit up and when someone steps on the X-Deck the hinge breaks and you are on all 4 of the grippy rubber feet. To reset the wheel kit just lift up on the X-Deck and the wheel kit will snap back into place. A number of wheel options are available upon request.